For over a quarter of a century, Designer Baskets have been valued for their extraordinary design and craftsmanship. Their creator, Derek Downing, began crafting his unique baskets while in high school. He has since exhibited his work at major craft and trade shows throughout the nation, and become acclaimed as one of those rare individuals who has elevated craft to an art form. Hailing from a creative pedigree, his parents being engaged in the fields of art and architecture, it was only natural for Derek to follow in their footsteps. 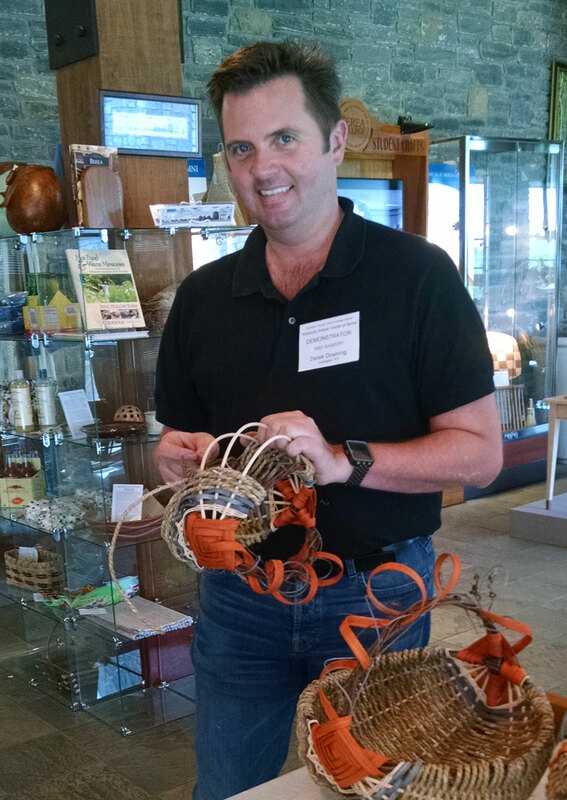 Traditionally, basket making is passed from one generation to the next; Derek learned the art of basketry from his mother, thus continuing that tradition. Each of Derek’s creations represents a distinctive flair for style and concern for detail. His designs are based on the traditional egg-basket form; however each has about it a contemporary quality. Most are crafted of grapevine, hand-dyed rattan and sea grass, an unusual material for woven baskets, and an aromatic one. The basket handles forged from grapevine allow the tendrils to dictate the basket’s overall shape. The vibrant colors of his baskets are frequently inspired by trends in fashion and home furnishings. Most colors are produced from commercial textile dyes, many of which Derek creates himself. Once completed, each basket is signed and dated by the artist. Whether you are a collector, or someone who simply enjoys living with beautiful, well-crafted objets d’art, a Designer Basket by Derek is certain to please in many ways and for years to come. His work can be found in craft galleries and fine retailers nationwide.